ad campaign, SEO, PPC, DSP, etc. 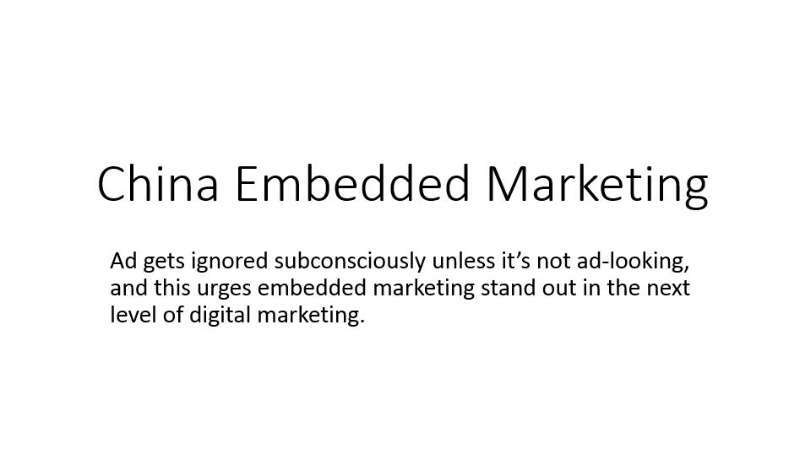 However, there’s one powerful embedded marketing, aka product placement, helping our clients embedding marketing messages in those hot and topic-related articles. According to Wikipedia, Embedded Marketing, also known as product placement, is a marketing technique in which references to specific brands or products are incorporated into another work, such as a film or television program, with specific promotional intent. What we focus here is, to help our clients embed brand/product message within those hot and relevant social articles in China. Recommendations: 90% of us trust recommendations from friends – so surely it makes sense to push the genuine endorsements we do receive to their absolute limit. User experience: It’s critical to the success or failure of a product in the market, and its social sharing influences greatly others’ buying decision. Apples-to-apples evaluating: Comparison is one of the most critical activities online that helps people have more info and knowledge for making buying decision among some of similar products. References: It’s a relation between objects, one for simple description and another for details with products therein. For more details, please fill up the following form and we will get you back within 48 hours. Please select your expectation from marketing project/campaign. When are you likely to start your marketing project/campaign? Please enter your Skype ID. Please note that we treat contacts as confidential and do not sell or share your contact or personal information with anyone.